Dr. Temple Grandin sat on a chair on the makeshift stage in Pomfret School’s Strong Field House, just moments before her scheduled talk. A large audience had gathered for her apparance in the rural Northeast section of Connecticut that locals call “The Quiet Corner.” After an introduction delivered by Head of School Tim Richards, Grandin approached the podium to discuss the topics that appear in her many writings: the autistic mind, humane livestock management, and her own remarkable career trajectory where those two seemingly disparate worlds meet. The prestigious private high school in Pomfret, Connecticut hosted Grandin as its 2019 Schwartz Visiting Fellow Friday, Jan. 19. 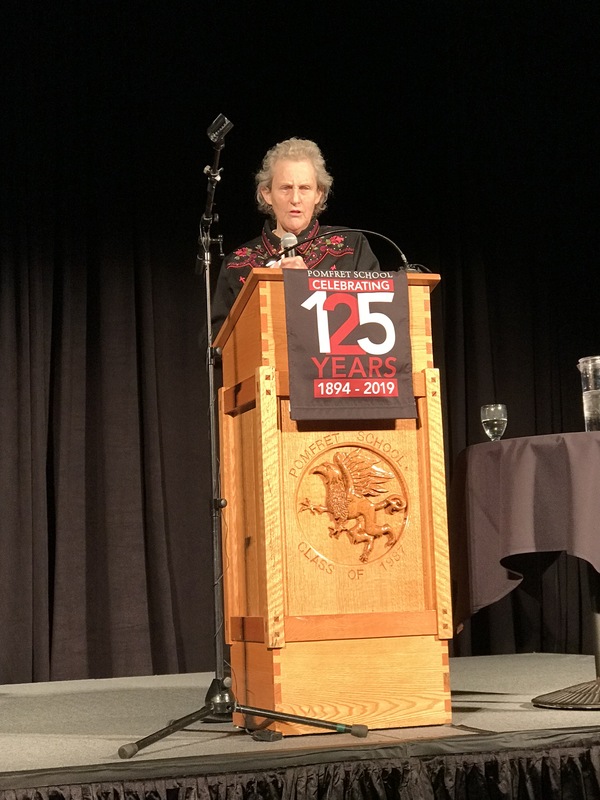 The event had originally been scheduled to take place in the school’s Hard Auditorium, but organizers had decided to move the event to the larger space of the field house to accommodate the outpouring of public interest in Grandin’s talk. Somehow the particular setting in Pomfret, both rural and academic in nature, was remarkably well-matched to the speaker. The audience seemed to agree wholeheartedly, greeting the declaration with applause and a few chuckles of recognition. I had stood in line for a book signing before the presentation. I chose one of Grandin’s most well-known books, The Way I See It: A Personal Look at Autism & Asperger’s, for her to sign. When my turn came, I introduced myself and gave my copy of the book to her. She wore one of her signature western blouses with a pink scarf, and admittedly I was a little star struck. Grandin asked me if I was a teacher. I was surprised, and a bit honored too, that she might guess that I was teacher. In retrospect, I wish I knew what prompted her to ask. I told her I was a journalist and she asked me about the publications I write for. With a line of people behind me also waiting to meet Grandin, it was not the time to ask her all the questions I had in mind. I could have spent a long time talking to her given the chance, coming from my background both as a journalist and as a mother of a child who has had diagnoses of autism and attention deficit disorder. Her shared wisdom about the minds of kids with autism had provided me with a measure of comfort and understanding at a very challenging time in my son’s early childhood development, so many years ago. I asked Dr. Grandin if I could have my picture taken with her, and she agreed. I walked around the table and crouched down near her for my photo-op. From this perspective, I could see that the line of people waiting for an autograph and a brief word with this remarkable woman had at least doubled in length. The room was getting louder by the minute as audience members continued to arrive at the field house. “These things must really tire you out,” I said to her as we smiled for a picture. I thought of the ways that people with autism process sensory experience, such as the din of people filing into the large room or the sight of the long line of people eager to meet the famed author. Autism is known to exist on a spectrum, and sensory processing sensitivities can manifest in a variety of ways. “Eh. I get used to it,” Grandin replied before I thanked her and moved along to my seat. Grandin was one of the first autistic individuals to explain to the world in common terms what it felt like to be autistic. When she was a child, doctors advised Grandin’s mother to commit her to an institution. Instead, her mother raised her at home and pushed her to learn basic social and practical skills. She also sought the assistance of speech therapists. Grandin credits these advantages as a foundation for her successful life today. Her presentation touched upon many topics including her own early journey navigating the world, finding her niche in livestock management design and how young people with autism can find their way. A central theme was the outright need for autistic thinkers in world that can expect to be both safe and innovative. In Grandin’s early career, she faced many obstacles; not all were due to her autism. In her high school and college years, she broke into the male-dominated world of livestock management on cattle ranches. This part of her life is represented in the 2010 movie Temple Grandin, in which Claire Danes played the title role. “Being a woman was much worse than the autism part,” Grandin said of facing sexism in this early part of her career. Grandin had a lot of practical advice for young people with autism and their parents. She argued for the need to develop hands-on, practical skills and creative outlets to develop problem-solving skills early on. “Too many kids don’t know how to tinker anymore,” she asserted. She argued that students with autism should find work or volunteer opportunities as early as possible, and before leaving high school, to develop both social and practical skills as a pathway into a productive career. She emphasized the importance of taking part in groups with shared interests and stretching just beyond one’s comfort zone. As a prominent thought leader who has taught the world how to understand the autistic mind, Grandin’s purpose is clearly focused on helping families support their child’s independence and unique character, rather than expanding a sense of disability or to make excuses. Grandin spoke about the need to find unique career opportunities and referred to “finding a back door” into the work world. Grandin’s mother did this for her when she advocated strongly for opportunities that may not have existed otherwise. Traditional career paths depend more heavily on social skills, but for those with autism, and those that support them, finding opportunities might require more creative approaches. “When you’re weird, you have to learn to sell your work,” Grandin asserted, with a humanizing authority. Another theme in Grandin’s lecture was concern over how modern school systems educate students on the spectrum or with other special needs. She advocated for the importance of hands-on and creative experiences in subject areas such as theater, art, woodworking, cooking and other skills that she says allow different mindsets to develop problem solving and expressive skills. She emphasized the importance of these creative experiences in the lives of great thinkers like Steve Jobs or Albert Einstein, who had creative hobbies. “Educators must not screen out students with unique skill sets,” Grandin said. She expressed concern that in the modern educational system, “I think they just teach them to take tests” and that “too much attention is paid to the deficit, with not enough building of the skills or strengths.” Both the limitations and the endless possibilities of a neurodiverse population deserve the widest range of opportunity. “Autism is an important part of me, but it is secondary in importance to my career,” Grandin contends. Grandin’s thoughts on the autistic mind, her plain talk about the topics we tend to complicate and her strength as a role model for others certainly impressed me as both a writer and as the mother of a child with special educational needs. The unique charm of Grandin’s lecture came from someone whose condition is supposed to preclude social concepts like “charm.” However, I walked away reflecting on how great people like Grandin help enrich us, not just by sharing their wisdom and their knowledge, but by challenging our own assumptions and practices.